Latest Update: The WBSEDCL Notification 2018 is not yet released. Hence aspirants who are waiting for WBSEDCL Office Executive Recruitment Notification 2018 can check here as we update the WBSEDCL Recruitment Notification 2018 as soon as it is released. Hence aspirants can download and prepare for WBSEDCL Official Executive Syllabus and get WBSEDCL Office Executive Previous Papers from below sections. West Bengal State Electricity Distribution Company Limited (WBSEDCL) Board has invited online application forms from all the Citizens of India to fill up the 247 Office Executive Vacancies. Therefore, this WBSEDCL Recruitment 2018 is the golden opportunity for the candidates who are eagerly waiting for jobs in West Bengal. The candidates are shortlisted for these WBSEDCL jobs based on their performance in Written Test, Computer Proficiency Test (CPT) and Interview. Therefore, the applicants prepare well to crack the WBSEDCL job. For proper preparation, the individuals need to download WBSEDCL Office Executive Syllabus & Exam Pattern which is available below. Visit our website Recruitment Hunt daily to get more latest updates regarding all Government Jobs Notifications, Syllabus, Previous Papers, etc. Aspirants who are preparing for WBSEDCL Office Executive Exam 2018 are facing difficulty in searching WBSEDCL Office Executive Exam Syllabus on various websites. Therefore, to solve their problem we have provided WBSEDCL Office Executive Syllabus & Exam Pattern at one place on our website. 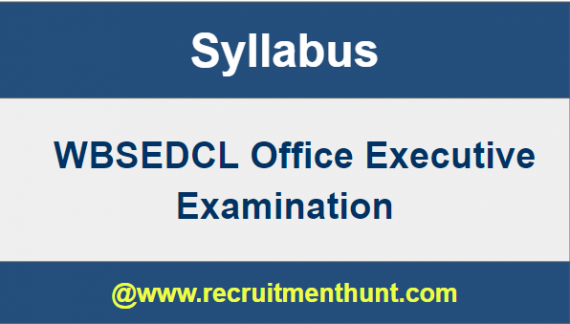 Hence, all the contenders can easily download WBSEDCL Office Executive Syllabus PDF and WBSEDCL Office Executive Exam Pattern 2018-19 from this page. As there will be huge competition, the candidates must start their preparation immediately without wasting their time. The WBSEDCL written test consists of multiple-choice questions for 100 marks from various subjects. The topic wise marks are given in the above table. For attempting the WBSEDCL Written exam, the time duration is 120 Minutes. The Computer Proficiency test is for 20 Marks and the duration is 30 Minutes. The complete subject wise WBSEDCL Office Executive Syllabus is provided below. Number, Ranking & Time Sequence etc. Heights & Distances Partnership etc. Therefore, the WBSEDCL Office Executive Syllabus & Exam Pattern 2018-19 has been provided in detail on our page. So, the candidates can easily access the WBSEDCL Office Executive Syllabus and Exam Pattern from here. Visit WBSEDCL website www.wbsedcl.in for any queries regarding WBSEDCL Career and WBSEDCL Job Vacancy. Finally candidates can check WBSEDCL Office Executive Syllabus and Exam Pattern here. So, applicants can make their preparation easier by following WBSEDCL Office Executive Syllabus. Download WBSEDCL Office Executive Exam Pattern along with WBSEDCL Office Executive Previous Year Question Papers through this article. Also, for more job updates subscribe and stay tuned to our website RecruitmentHunt.